Our community is: Lincoln County, Pike County and St. Charles County. 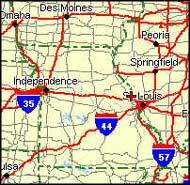 St. Louis is within driving distance of all three counties; we are considered a part of the Metro Area, yet our municipalities are small enough to have that home town feel. Jungermann Realty invites you to explore our area by using the links below. You will discover that our community would be an excellent place for you to build a new home, buy acreage for recreation or development, educate your children, or entertain your grandchildren. Missouri real estate is a good buy whether it is a home, farm, or manufactured residential.